The game will feature real-time multiplayer deathmatch matches, challenging players to defeat their opponents to earn points. Mobile game publisher Chillingo has announced WarFriends for mobile devices. The game is being developed by Mega Dead Pixel developer About Fun, and will offer real-time multiplayer shooting action, as players work to defeat their opponents, earning points and unlocking upgrades to make their army stronger over time. In WarFriends, players will compete in timed deathmatch matches, working to earn as many kills, and as many points as possible before each match ends. Players have access to a variety of units as they play, and can deploy these using “cards” in the bottom of the screen. About Fun aims to have at least 20 different unit types in WarFriends at launch, with each having different stats and specialities. Snipers hide in the distance waiting for the perfect critical hit, shotgunners charge enemies directly from close range, drones strengthen your defense by shooting the most dangerous enemy units and engineers build turrets on the battlefield and repair damaged armored units. Each unit also has a special upgrade slot, which adds an extra perk like recharging armor or an extra anti-aircraft turret. Gamers earn points for their kills, with bonus points coming when gamers pull off impressive shots, like headshots or especially long shots. To change things up a bit, players can play WarCards, which each have a different effect on the battle. We have pretty basic (but crucial) ones like “Health Pack,” which heals you, but also cards like “Head Ahead,” which enlarges the heads of enemy soldiers for 30 seconds. Head Ahead is very useful because not only does it guarantee you easier headshots, but it also looks super funny! Check out the rest of our interview with Vodak below, to learn more about what we can expect from WarFriends when the game launches on iOS this summer. SocialTimes: How you would you describe WarFriends, to someone who has never heard of the game before? 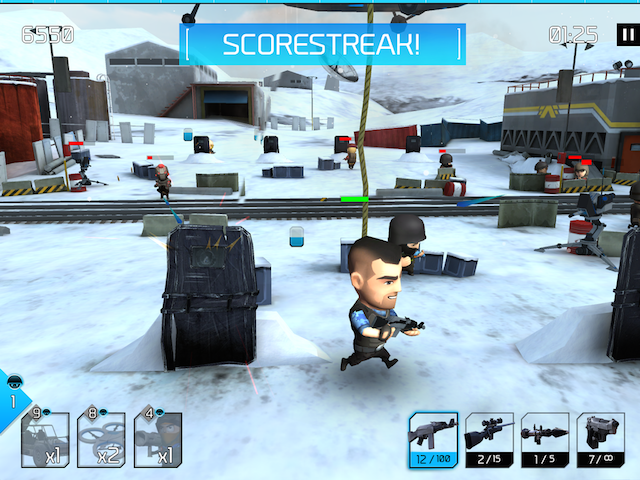 Petr Vodak: WarFriends is a fun 3D arcade cover shooter with unique tactical elements. The core experience is real-time deathmatch multiplayer where two opponents and their armies will duke it out on the battlefield. You will shoot, throw grenades and dodge bullets as you move between destructible cover spots. You’ll also have to deploy troops and use WarCards to wear down your opponent’s defenses. ST: How long has the game been in development? PV: The idea of WarFriends emerged at the end of 2012, which was before we had even finished development on Mega Dead Pixel. We started working on first prototypes later in 2013… how the time flies. ST: WarFriends is quite the departure from Mega Dead Pixel, but what did About Fun learn from the huge success of that game that shaped how your future games are being developed? PV: We definitely learned that it is very important to present the game to players much earlier during the development process and to gather feedback as soon as possible. Mega Dead Pixel was also our first experience working with a big publisher such as Chillingo, and we saw all the benefits that this kind of cooperation brings. ST: From the trailer, there appears to be a moving blue line at the top of the gameplay screen, which relates to the player’s score and combo points (that is, the faster players score points, the faster it fills). Are we understanding that correctly? PV: That is our scorestreak bar, which rewards a fast, dynamic play style exactly as you described it. When the bar is filled, a friendly aircraft flies over the battlefield and drops a crate containing a random bonus such as extra ammo, additional Kevlar, “grenade shower” and lot of others. It is a risk/reward mechanism because you have to shoot the crate before the opponent does and steals your bonus. You can, of course, steal enemy crates as well, which is really satisfying, and can even turn the tide of the battle if you are lucky.